Get Up and Go Wild With Walking The World! Don’t wait. Find a pet sitter, lock up the house, pack your hiking gear, buy a plane ticket, and head to the airport. Now. I’m serious. Oh, yes, find a hiking partner for this unique hiking tour if you can, but if you can’t, no worries, go by yourself. You’ll be just fine. After all, in 2013, more than 200,000 adventurous souls from all over the world set out on their own personal journeys to walk the Camino wearing boots, tennis shoes, flip flops, sandals, or just what Mother Nature gave us, our bare feet. So why are people drawn to walk the Camino? When you walk the Camino, it’s you, the trail, and life’s bare essentials. You walk. You eat. You sleep. And then you start all over again the next day, doing just what we were born to do. While society gets more and more complex and moves at an increasingly faster pace, our real strength, happiness, connection with self, others and our planet, blossoms at a pace closer to walking speed, about three miles an hour. It’s in this simple act of moving from one place to the next, under our own power, exploring and experiencing, that we once again begin to touch the best of who we are. It’s out there, on the trail, where we can finally take a deep breath, start to relax, look up and finally see what this life is all about. Walking the Camino is what adventure travel is all about. The Camino is also about camaraderie, something we all yearn for but rarely find enough of. As I walked along the Camino this past fall from Leon to Santiago, there wasn’t a single person in more than 190 miles that didn’t greet me with a smile, a nod or hello, and the traditional trail greeting of Buen Camino. This may not seem like much, but it’s a powerful elixir. Having complete strangers from around the world acknowledge my journey was powerful beyond belief. On the Camino you have instant community. Everyone is heading in the same direction and to the same destination. So, if you decide to walk the Camino, you’ll never lack for companionship, friendship, or community. We’re drawn to the Camino because it’s what we were born to do. By that I mean walking, in the outdoors, for long periods of time, over long distances. It’s what we started out doing in our early days on this planet and, now, it’s what our bodies, minds, and hearts are telling us to do once again. The history of the Camino, a Christian pilgrimage to the cathedral in Santiago de Compestela in northwest Spain, dates from the 9th century. Pilgrims have been following this path for centuries, all the while intrinsically hearing the call to come and trek, just like I did and, as, I’m sure, many of you have. It’s in Santiago where the remains of the apostle St. James are reportedly buried and the reason pilgrims originally started walking the Camino. More recently, the Camino has been named one of Unesco’s World Heritage Sites and, in 1987, the first European Cultural Route. While these official designations are noteworthy, I believe most people go because they know they need to. They know they need to reconnect with who they are, with the physical being that sits quietly inside all of us, waiting for us to heed the call to get up and go wild. Like geese migrating, when we begin to sense the movement of others making the trek from one place to another, we, too, feel the call and the need to respond. We may not recognize our motive as one so basic and elemental, but it’s there. Every fall Grizzly Bears sense the need to find their way to a safe haven for the cold, long, and dark winter months. Birds, butterflies and almost every other species on this planet, at one time or another, heed the call to move, to find their way back to where they started, like salmon returning year after year to their spawning grounds. We feel those same callings but only infrequently recognize them for what they are and only a small few then take the action necessary to answer that calling. Truthfully, often we just don’t understand why we feel antsy, nervous, or a yearning for the unexplained. As we all experience more stress on a daily basis, and become less fit and more disconnected, that primal urge to move, to reconnect with self, place and others, once again emerges. Like the butterfly that breaks free from a rigid cocoon, more and more of us are taking time to go and see what it’s all about. We’re drawn to the Camino because it is a challenging venture. We need a challenge, and yes, some degree of risk, to really feel alive. People don’t walk the Camino, really, to get in shape, they walk it because as they complete one more challenging day, walk one more mile, and feel progressively a bit stronger, their self-esteem also increases. They intuitively know they’re getting stronger in so many ways. And it’s a cycle that feeds on itself so that while on day one walking nine miles might have seemed difficult, walking 22 miles on day 11 seems like we quit too early. In our society, it seems like we’re striving to do the least possible in hopes that we can indeed get healthy, fit and firm. Studies, supposedly show, that walking 30 minutes a day is enough. Enough for what? To provide us with the bare minimum of health? Maybe. But health, in all ways, does not come from moving a few minutes a day. Vigorous, vital health comes from continual connection with the great outdoors through long walks on a regular basis. The more we walk, the more we connect and the better we feel. Thus, the real power and spirit of the Camino, or any long walk, the walking itself. Walking for hours on end, body, mind, and soul working as one, in nature, seeing and experiencing beauty in every step, living life fully in every moment. So yes – you should go now – because there’s absolutely nothing better that you can do to reconnect, recharge, and revitalize your life. Walking the Camino is a walking vacation to remember. Head for the Camino – it’s where you belong. On the trail, walking. If you haven’t seen the somewhat recent film THE WAY, with Martin Sheen, it’s a good watch, and you’ll get a glimpse of what the Camino de Santiago is like. For those of you reading this who’ve wanted to walk the Camino but wondered whether you could physically make it, the answer is – absolutely yes. While the daily mileages can be long, the terrain for the most part is relatively moderate. Plus, if you have the time, you can always take a break and search out the best local food and drink while recovering or healing a blister or two. 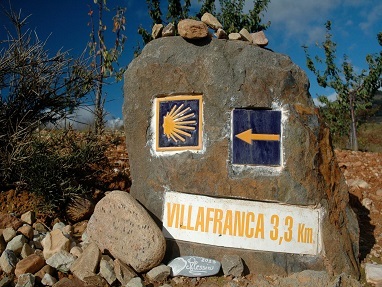 Want to walk the Camino – with a local guide? I’ve been designing and leading small group walking adventures around the world since 1987, and would love to share the magic of the Camino with you. As they say on the Camino – Buen Camino!